You've been sitting there for hours. You want to write. You need to write. You've actually made time to sit down and get work done. But are you writing? No. You're browsing through social media and searching gifs of cats on Google. Sometimes writing can get boring. The scenes you're working on may not be the most exciting scenes in the world, or maybe you're stuck and trying to dig yourself out of a plot hole. Maybe you've been writing 5,000 words every day for two weeks and finally feel burned out. Maybe you're just bored with your story. 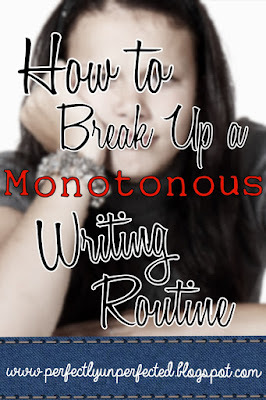 Whatever it is, writing feels like nothing but work and you're super bored with your routine. 1. Go outside. It's amazing what fresh air can do for your body, and sometimes it's really all you need to feel energized. Take a walk around for a half hour, or maybe even bring your laptop or a journal outside and sit in the grass to write or brainstorm. 2. Go to a coffee shop. If you need a change of scenery but it's too cold/hot to go outside (or you just hate the outdoors), then taking a trip to a nearby coffee shop may just be the remedy you need. Coffee shops are generally super relaxed environments with quiet atmospheres and a soothing, delicious smell (unless of course you don't like coffee. In that case, get off my website. )(Just kidding please stay you're amazing). 3. Go to a different room in your house. If you don't want to go outside or can't get to a coffee shop, then this simpler change of scenery might just do the trick. Pick a room that's quiet and secluded, like an office or guest bedroom. More importantly, pick a room without many distractions! 4. Change up your writing space. Okay-- if you can't go outside or to a coffee shop and there are no other spaces in your house for you to write, then it's time to change up your writing space. If you usually write at your desk, try sitting on your bed. If you usually write in bed, try writing on the floor. There are all sorts of possibilities to try. One is bound to work! 5. Redecorate your desk. ...So you're super attached to your desk and can't write anywhere else, hm? Okay, then--redecorate it. Move things around or hang up some quotes/pictures on your wall. Maybe even move your desk to a different spot in your room. It's a small change, but it's still a change--and it can still help. 6. Switch to writing by hand instead of typing (and vice-versa). This is usually my last resort, and it tends to work for me every time. Sometimes simply switching from keyboard to pencil is enough to get my writer brain working again, and I end up with a notebook full of plot ideas! And there you have it! Six ways to help you break up a monotonous writing routine. Also, the first chapter of Unperfected is still available for you to read and critique! You can check that out here. I've received some great feedback so far, so a big thank you to everyone for that! Brilliant post, Miranda! I just did #5 last week and it helps so much. I'll have to try your other suggestions next time I get in a rut. Hey there, Miranda! Thanks for the follow, you're a peach. I'm in love with your blog! The design, the title, your writing...so awesome. Looking forward to snooping around more soon. This post is so on point! I cannot write at a messy desk, at all. If I try, I'll just get frustrated with whatever I'm writing, regardless of how good or bad it might be. A lot of times I don't write because I can't stand being in front of a screen for another second. Going outside for a walk is definitely like a "reset" button for that (same goes for just picking up a book and reading!). Also, there's a bunch of local coffee shops around here that are utterly incredible for both getting away and inspiration. I'm so glad you can relate to this post! And that's awesome about your local coffee shops. There's a few near my house, but the only one I ever really go to is a Starbucks just down the road. It's amazing what a change of scenery can do!